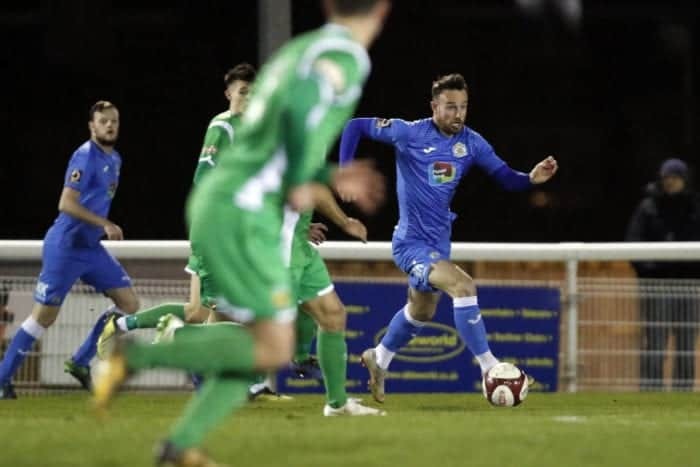 The Hatters bowed out of the Cheshire Senior Cup on a windy evening at the Weaver Stadium, as holders Nantwich Town deservedly went through to their third successive Final. A pair of goals for the ‘Dabbers’ immediately either side of the interval was followed by a third 10 minutes from time to end the Hatters’ interest in a competition that they last won – on their most recent visit to Nantwich, as it so happened – in 2016. 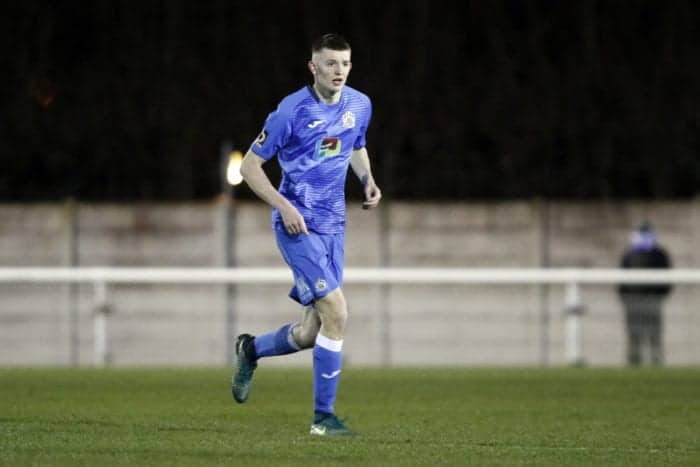 As had been the case for all previous rounds, several first-team regulars were rested for the Semi-final tie – although the usual mix of senior players and Academy members or graduates on this occasion included, in Lewis Baines, Scott Duxbury, Frank Mulhern and Matty Warburton, four members of the National League North squad who had not featured at earlier stages. 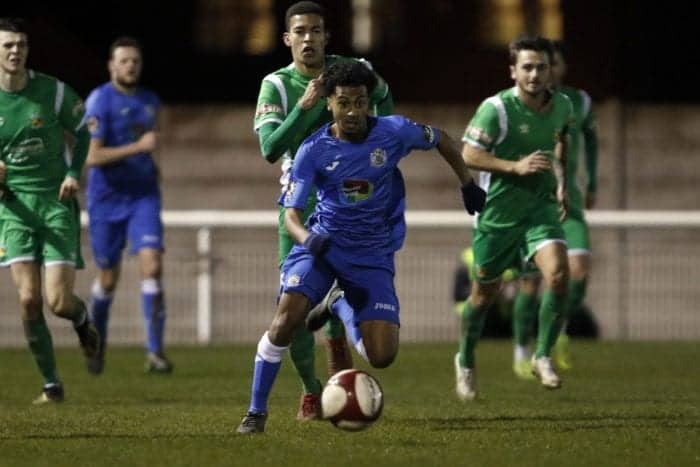 County, courtesy of a 3-4-1-2 formation, declared an attacking hand at the outset, although the hosts created the game’s first chance after two minutes, when much-travelled, 39-year-old Jamaican striker Ricardo Fuller executed a half-volley that Ian Ormson dived to smother. Leading scorer Warburton looked lively for the Hatters in the opening exchanges, as he drilled one shot wide of the right post and saw another deflected past the opposite upright. And home goalkeeper Will Jääskeläinen – son of retired Finnish custodian, Jussi – did well to parry away a strike by Duxbury from outside the box. Nyal Bell, who had not featured in the senior squad for its last two matches, fired one effort into the right side-netting – and unleashed another, just ahead of the half-hour, that Jääskeläinen tipped around the left post. But the contest was beginning to become an end-to end affair, as Ormson blocked a snap-shot by Jamie Morgan – before venturing out of his area to break up a further attack, and watching with relief from no man’s land as Sean Cooke chipped wide of an empty net from distance. Jääskeläinen saved further attempts from Mulhern and Bell with half-time approaching – but, just as the Hatters looked set to go in at the break goalless for a fifth match running, Nantwich took an added-time lead, after Cooke’s shot from beyond County’s area hit the inside of the left post and Morgan reacted quickest to turn in the rebound. HALF-TIME: Nantwich 1 (Morgan, 45 + 1), County 0. 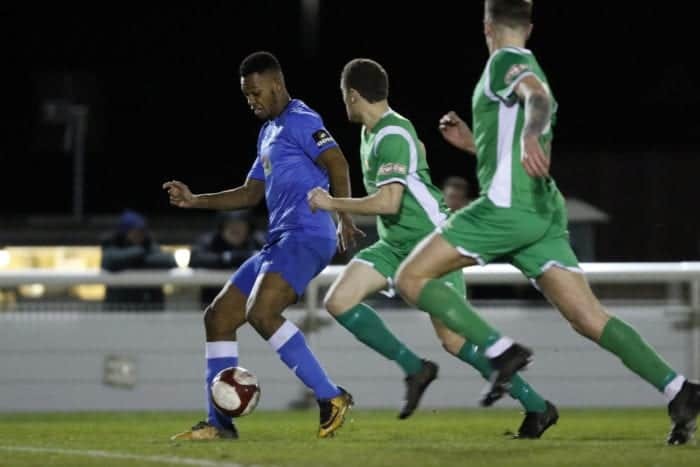 The Evo-Stik Premier hosts, now with the wind behind them, earned their first corner of the evening two minutes after the resumption – and consequentially doubled the advantage, as Cooke’s delivery from the left found Joel Stair who struck home from within the six-yard box. Much of the action was now concentrated at County’s end, as Baines slid in to rob Joe Malkin of the chance to convert a squared pass by Caspar Hughes – who was himself denied a couple of minutes later, when only a desperate goalmouth scramble prevented the captain, once of AFC Fylde, from prodding home a third goal for his team. 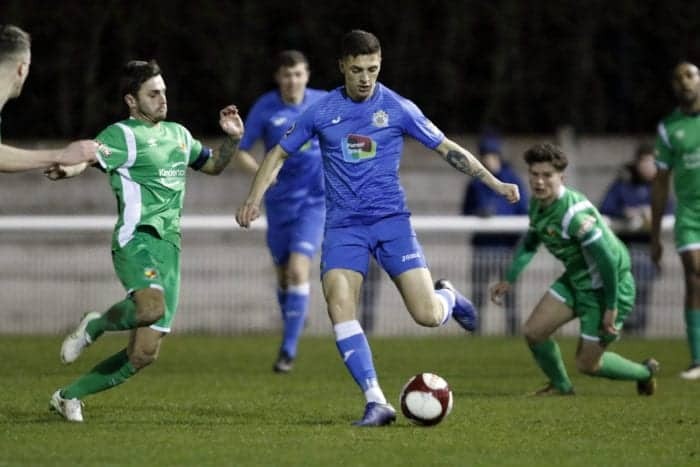 As the hour-mark drew close, Nantwich gained a further chance of increasing the lead through the award of a penalty, following Jordan Downing’s foul on Fuller. But the hosts’ preceding fortunes from 12 yards – with five out of seven spot-kicks missed – did not bode well for them, and Ormson guessed correctly in diving to his right to parry behind Toby Mullarkey’s mid-height kick. Ormson prevented further increases in the two-goal deficit by holding on at the second attempt to Cooke’s free-kick from outside the County ‘D’, and gathering a Hughes shot through a crowded box – but had little chance when, after 80 minutes, a flowing Nantwich move saw Cooke set up substitute Callum Saunders, who fired low into the bottom-right corner to settle the tie. FULL-TIME: Nantwich 3 (Morgan, 45 + 1; Stair, 47; Saunders, 80), County 0. Team: Ormson, Whitty, Duxbury (Elhassan, 72), Turnbull (Capt. ), Downing, Baines, Robinson, Holt, Mulhern, Warburton (Czubik, 56), Bell (Greenhalgh, 61).